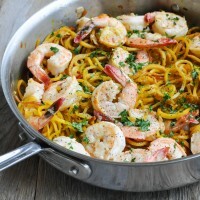 This Paleo Shrimp scampi comes together easily with spiralized, slightly sweet and starchy golden beet noodles, a flavorful lemon garlic sauce, and pan seared shrimp. In a large pan that has a matching lid, melt half of the butter over medium/high heat. When the butter is melted, add the chopped onion and cook until translucent. Add the garlic and cook for an additional 2 minutes. Add the shrimp and let them cook on one side for 2-3 minutes then flip them over to cook on the other side. While the shrimp are cooking, season with half of the salt, half of the pepper, and 1 tablespoon of the lemon juice. Stir and then spoon out and place in a separate bowl while we cook the beet noodles. Note: shrimp are essentially done cooking when they turn white/pink. As soon as this happens, they’re done and you can remove them from the heat – lest, they start to become tough due to over-cooking. To the pan, add the remaining butter to melt. Once melted, add the beet noodles, stir, and cover with the lid to steam/cook for 7-10 minutes. Remove the lid to stir and test that the beets have started to “give” a little in texture. When they’re finished cooking, they’ll have the consistency of pasta al dente. Season the beet noodles with the remaining lemon juice, sea salt, and pepper. Stir and add the shrimp back in to re-heat through. Sprinkle with the parsley and enjoy!